We celebrated Mr. Wonderful’s birthday over the weekend, so naturally I wanted to whip up something special to put a candle in. And since that man loves a good chocolate-cherry combo, I knew these cupcakes from One Sweet Mess would be perfect. Since it’s January, I fully expected to use frozen cherries with this recipe, but lo and behold, our local market had fresh ones right up front. Yes, I realize it’s not cherry season. I didn’t ask questions. Hold your fire. Preheat your oven to 350 degrees. Meanwhile, line a 12-cup muffin tin with cute, bow tie cupcake liners that your husband won’t notice, but you’ll be pleased with yourself, so do it anyway. In a large bowl, whisk together the melted butter and sugar until combined – followed by the eggs one at a time. Add the sour cream, vanilla extract and almond extract. I actually pulled out my hand mixer for this part of the job because my whisk makes life harder than it should be. Now add the dry ingredients to the wet ingredients and mix well. Again, the hand mixer worked beautifully here. About 30 seconds to a minute on low should take care of it. Use a rubber spatula to fold in a heaping, half-cup of chopped cherries followed by an equally generous amount of mini chocolate chips. Mix gently. Fill each cupcake liner about 2/3 of the way full. (An ice cream or cookie scoop makes it easy to transfer the batter.) Then, pop these in the oven and bake for 20-25 minutes. My gas oven took the full 25, but if you’re not sure, do the toothpick test at 20. Once done, allow the cupcakes to cool in the tin for a couple minutes before transferring elsewhere to cool completely. If you’ve got a stand mixer, I applaud you. This frosting is perfect for it. I, however, do not, so my hand mixer was happy to oblige once again. Cream that butter until light and fluffy. This only took me about 30 seconds on low. Gradually add the powdered sugar to the bowl, stopping the mixer if necessary to scrape down the sides of the bowl with your rubber spatula. 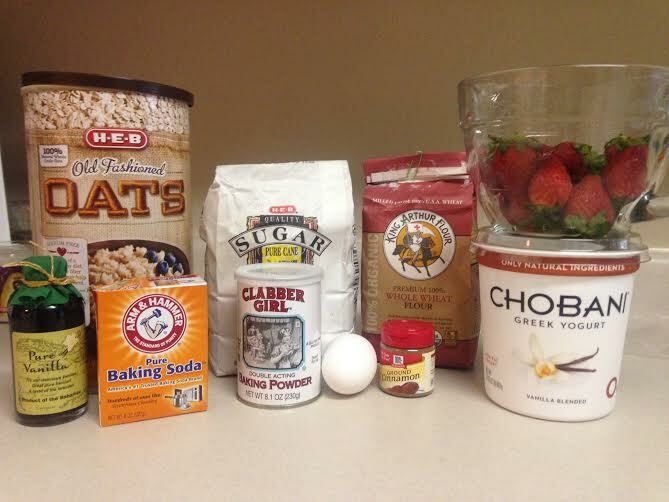 Once all the sugar has been added, turn the speed up and beat it all together for a full minute. Now add every bit of the lovely dark paste from that vanilla bean to your mixture. It won’t look like much, but it goes a long way. Drizzle in the heavy cream and whip it good one last time. Again, for about a minute. Transfer the buttercream to a piping bag – or frost your cupcakes with a butter knife. Whatever creams your cake. Finally, give it a lil swirly and top with a fresh cherry. Makes about 15 small cupcakes. I recently came across these good morning muffins on The Lemon Bowl, a blog written by a recipe developer with a focus on seasonality. And with berries in full seasonal swing, baking seemed like good timing. Not to mention, I recently acquired a silicone muffin pan as a wedding gift and figured I could christen it with these babies. Less clean-up? Sign me up. 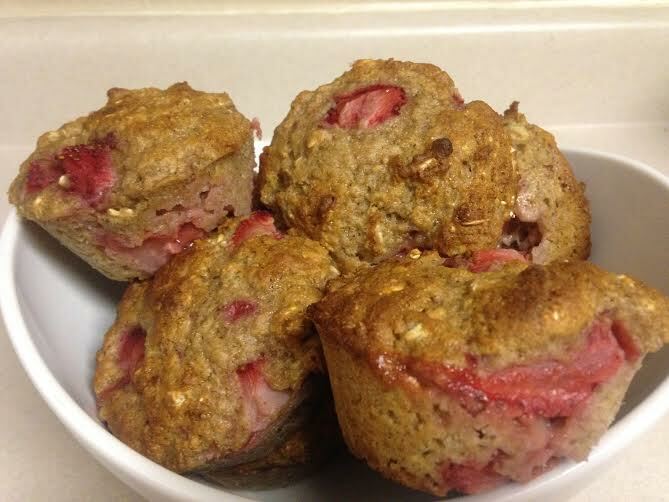 This recipe is my slightly adapted version of The Lemon Bowl’s strawberry oatmeal yogurt muffins. Not a bad little breakfast, y’all. Especially when you un-healthy them with just a little pat o’ butter. Preheat oven to 375 degrees and spray your muffin pan with cooking spray. Whisk together dry ingredients in a large bowl and set aside. In a medium bowl, whisk together yogurt, egg, oil and vanilla. Slowly pour the wet ingredients into the dry ingredients and stir to combine. Next, fold your strawberries into the batter. Using a spoon or ice-cream scoop, divide the batter evenly among 12 muffin cups. Bake for 20-25 minutes or until a toothpick comes out clean. 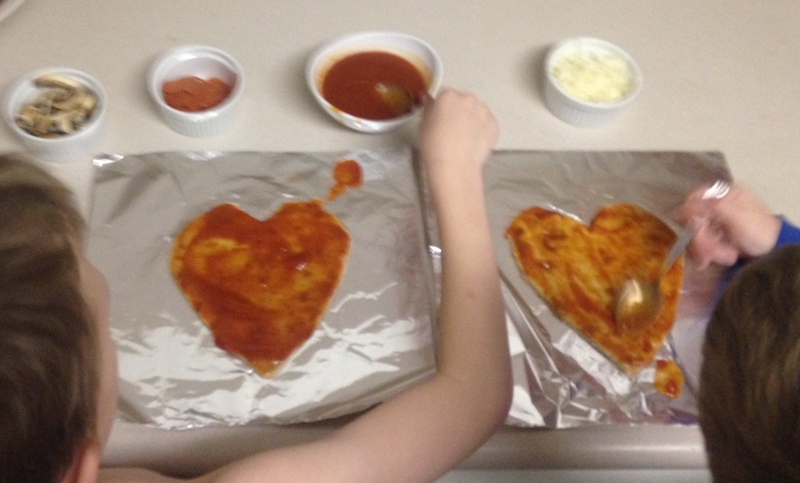 I got a little carried away with heart-shaped fare this weekend. 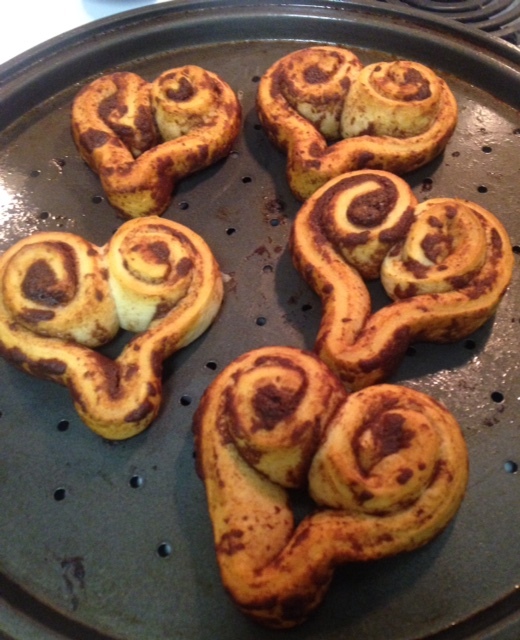 We started our Saturday with these love-themed cinnamon rolls. No fuss. I just picked up a can of pre-made dough at the grocery store, rolled each pre-cut section into a heart and then baked as directed on 400 for about 10 minutes. Our Valentwins added some frosting and red sprinkles, and I served them alongside some fresh strawberries. Easy, festive and amusing. Clever, but way outside my realm of creativity, child. 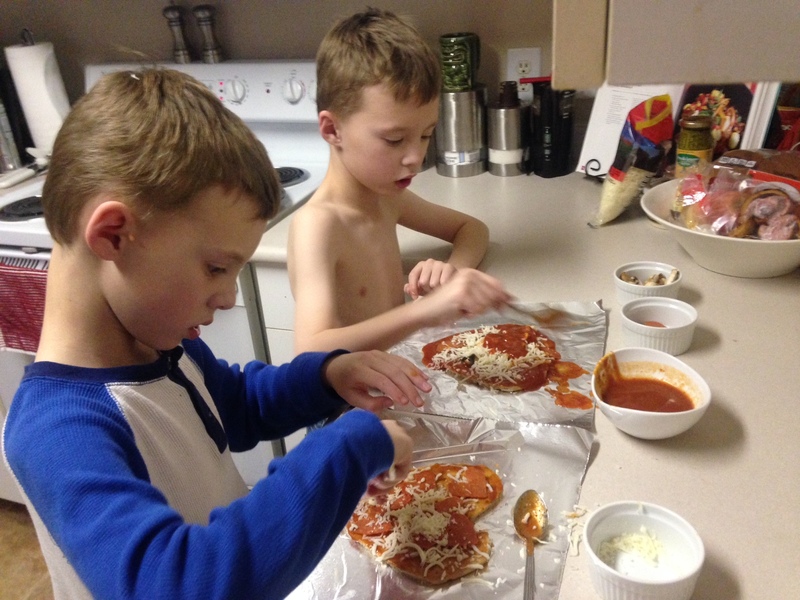 We stuck with the original plan: Heart-shaped flat bread, a few simple toppings and voila. Have a look. This gal even hand-cut the pepperonis into tiny hearts, y’all. Who am I? *These flavorings can be interchanged with brandy, grappa or limoncello, based on your preference. Stir together sugar, butter and flavorings in a large bowl. Then stir in the almonds and the eggs. Stir in flour, baking powder, and salt until just combined. Chill dough, covered, for 30 min. Preheat oven to 350° with rack in middle. Using moistened hands, halve dough and form 2 (16 X 2-inch) loaves on a large baking sheet fitted with parchment paper. Or, form 3 smaller loaves for smaller biscotti. Bake until pale golden, 20 – 25 min. Transfer loaves to a rack and cool for 15 min. Cut loaves into ¾ inch slices using a serrated knife. 20 – 25 min. 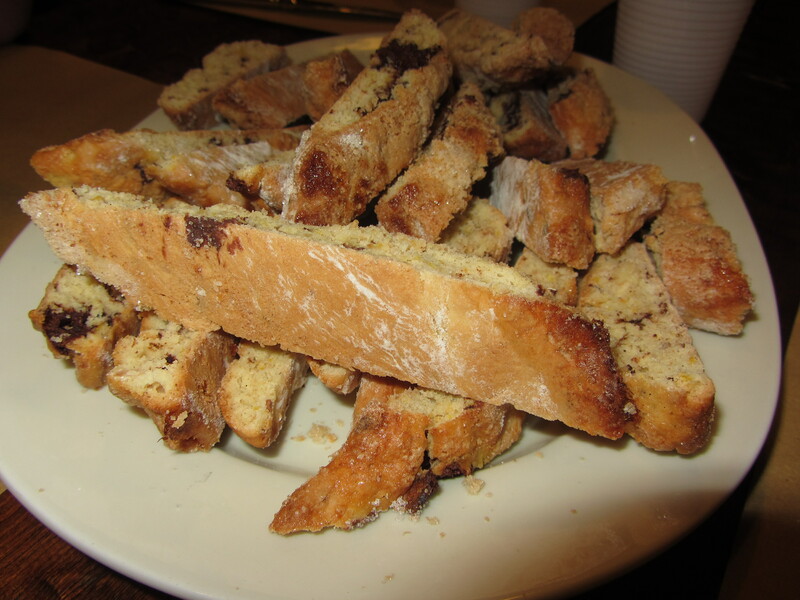 turning once, or less time if you prefer biscotti to be less crunchy. Transfer to rack to cool completely before storing. Note: Keep in an airtight container at room temperature. Biscotti will improve in flavor after 2 days. The name means “pick me up,” and it does, indeed. There are many different versions of this popular dessert, but this is the true peasant version. Beat the egg yolks and sugar together with an electric mixer until pale and thick. Slowly beat in the marsala and the water. Add the mascarpone, and beat until the mixture is thick and smooth. Next, drop three lady finger pieces in the bottom of each of wine glass or other bowl shaped serving piece. Drizzle 1/3 to 1/2 of the coffee mixture over the lady fingers. Then, spoon in 1/3 to 1/2 of the mascarpone, and sprinkle with the chocolate mixture. 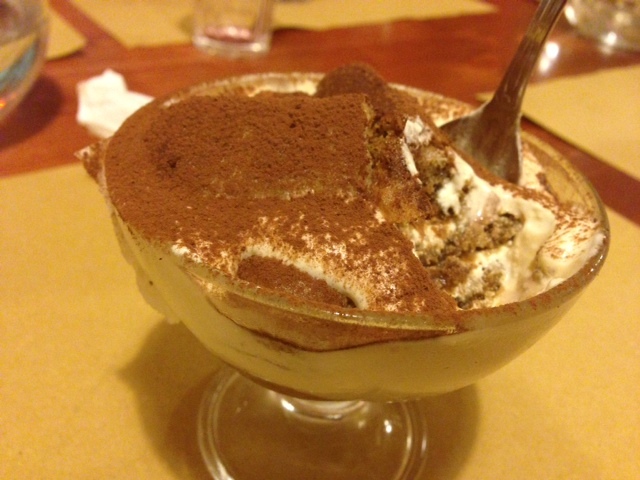 Repeat with one or two more layers (depending on the size of the glass) with the remaining ladyfingers, coffee, mascarpone, and chocolate. Cover and chill for 2 hours before serving. Makes 4 to 6 servings, depending on the size of the glass.